Foot Pain and Sore Feet - a fact of life? The human upright gait takes its toll on the body. It creates considerable stress for our locomotor system (the ability to move using the muscular and skeletal systems) and especially for our feet. The feet carry the whole of our body weight and walk an average of 5,000 steps a day. Our modern lifestyle and leisure activities for example sports, and the wearing of high-heeled and uncomfortable footwear, make us more prone to pain in the feet. Who suffers from sore feet? As our feet are under stress every day, most people suffer from pain in a foot (or pain in both feet) at some time in their life. Usually this pain is harmless and disappears by itself after a short period of time. It often happens as part of the normal ageing process, but sometimes, it is the result of a more serious health problem or deformity such as rheumatoid forefoot. When the pain persists, it can severely limit normal activity, when this happens the feet should be examined by an orthopaedic specialist. Common symptoms include, tenderness of the ball of the foot and toes due to a neuroma (a neuroma is the swelling of a nerve due to compression or trauma), pain in the heel (plantar fasciitis or plantar fascia), joint pain due to a bunion (hallux valgus), arthritis, or recurring pain following forefoot surgery (the front part of the foot including the toes). Depending on the type, severity and cause of the foot pain, it may be possible to use non surgical treatments such as foot gymnastics, adduction or abduction (re adjusting the position) of the toes, medical treatment, special orthoses (supports), shoe inlays or orthopaedic shoes. However, early specialist diagnosis of foot problems is essential if non surgical treatments are to be successful. Unfortunately, many patients only consult their doctor when their feet are already showing considerable problems. If the foot pain cannot be eased by other means, then surgery may be the only solution. The aim is to compensate the traction in the foot (grip between the foot and the ground), correct the pronation (angle of movement of the foot), and align the lower body, thus ensuring the muscles, particularly the adductor muscles (from the heel to the toes), are back in balance. Chevron osteotomy is a standard procedure to correct bunions, but there are alternative methods appropriate for other malpositions, even in cases of more excessive angular deviations. During the follow-up treatment, it is important to re-establish muscular balance and to stabilise and strengthen the foot. This is obtained through mobilizing exercises, massage and specialised therapy. When should I contact my doctor about foot pain? You should consult a medical professional if the pain persists for more than three days, gets stronger when strained or occurs alongside other diseases. You should consult an orthopaedic specialist immediately if pain leads to a reduction in the range of motion, if the skin is reddened at the same time, if a fever is present or if the joint is swollen. What can be done to prevent foot pain? Sometimes it is possible to reduce discomfort by avoiding overstrain. Overstrain might be caused by taking long walks excessive running or jogging. It may also be caused by adopting an over compensating posture (finding a new walking position to reduce the pain). The reduction of overstrain can be achieved through using comfortable well-fitting shoes, with inserts and damping (shock absorbing) heels. Strengthening of the foot muscles through foot gymnastics is also recommended. Footbaths, foot massages and weight reduction will also have a positive effect on sore feet. Acute foot pain due to bad posture or overstrain usually disappears by itself over time. Sometimes it can be helpful to use bandages, ointments or plaster bandages to immobilize the foot and help it recover. Strong pain can be temporarily alleviated with anti-inflammatory painkillers, but they will not eliminate the cause. If it is the joints of the foot that are causing pain, local anaesthetics or cortisone preparations may help. In certain cases, only surgery will reduce the pain in the long term. 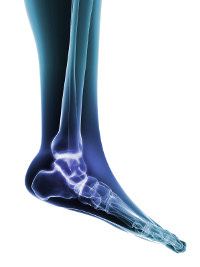 Comprehensive advice can be obtained from a foot specialist.